The first time I heard Terrorvision was in the mid-1990s. This was a time when rock bands were either ashen faced, pseudo-Goth purveyors of doom or immense haired rawk gods. Both have their place, but neither's place is anywhere near me. So when a bunch of musicians dressed in blue suits, jumping in and out of the ocean, dancing like, well, me and sounding cheery appeared, I sat up and took notice. 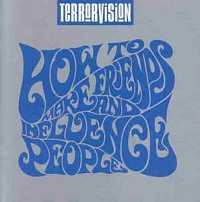 The single in question was Obliviontaken from the band's second album How To Win Friends And Influence People and it was everything I was looking for. Bouncy, cheery, mildly science fictional rock pop with its tongue firmly in its cheek, and its sense of rhythm somewhere on the Keighley/ Bradford border. I was hooked. Whilst this was my first exposure to the band, they'd actually been around, in some form, for years prior to this. Formed at school, the first member was David 'Shutty' Shuttleworth, followed by bassist Leigh Marklew, guitarist Mark Yates and, finally, vocalist Tony Wright. The method of Wright's induction into the band tells you everything you need to know about their mindset. After an advert in Kerrang! failed to turn up any suitable candidates, Wright turned up to audition. His audition consisted, apparently, of watching Mark Yates sing Teenage Kicks. He was hired... And it worked like a charm. Wright's rapid fire, slightly gravely vocals would become as much a part of the band's sound as the strong drum line, the chunky guitar and the devastatingly hum-able choruses. What followed over the next two years was a string of demos, a five album deal that became a three album, then a 12-inch single, then nothing (Although the band did gain a manager out of it) and a constant, steady improvement as more demos were recorded and the band become more and more committed to their work. Finally, on their sixth demo, financed by EMI, the band was signed. They were even given their own label, Total Vegas Recordings, which all their albums would be released on. The following year saw the release of Formaldehyde their first album. It's an interesting listen for a number of reasons, not the least of which is how close it shows the band were to their influences at this point. The hardest edged of the five albums released, Formaldehyde is clearly an album influenced by the likes of Black Sabbath and KISS. Yates' guitar is front and centre, Wright's vocals have never sounded harsher than they do here and the whole thing looks, feels, and sounds like a flat out heavy metal album. It's interesting then that My House, the first single from that album remains one of their most enduring tracks. It's classic Terrorvision, starting with a swaggering guitar line from Yates that fits seamlessly behind Wright's vocals. Together with a strong bass line and Shutty's signature drum work, the song builds into the best track on the album, a grinning, swaggering track with it's tongue firmly in it's cheek. In my house/ Get down the stairs/ My house/ Till your daddy's home/ Listen son there's a few rules you should know 'bout living in my house/ Do as you told/ My house/ Have you got that straight?/ My house, and if you wanna own it then you'd just better wait. How To Make Friends And Influence People was the breakthrough album and listening to it, it's easy to see why. The time in America did all of them the world of good and the change in quality between Formaldehyde and Friends... is astounding. From the moment Yates' driving urgent guitar opens the first track Alice, What's The Matter? it's clear this is a band who've come a long way. Friends is an album crammed full of fantastic tracks and it's no surprise that four singles were released from it. From the dark, urgent Alice to the almost thrash metal of Pretend Best Friend, the album is a constantly impressive, often very funny collection of songs. Friends was the success it richly deserved to be and the following year saw the band tour extensively and pick up numerous awards. Most notable amongst these was the Best Band award voted for by the readers of Kerrang! magazine. Terrorvision were the first British band to win this since Iron Maiden in the late 1980s. They rounded the year off with appearances at several festivals then returned to the studio to record their third album. Regular Urban Survivors was another remarkably strong album and saw the band at their most comfortable. This is the album where everything doesn't just work, it works beautifully. Perseverance, my personal favourite track, is a perfect example of this. It manages to combine the emotional honesty of the band with a fantastic guitar riff, a near rap from Wright and, rather wonderfully, a heavy dose of 1950s' doo-wop. Perseverance is one of those magic pieces of music where you find yourself, despite best efforts to the contrary, grinning by the first chorus. It's also one of the most even handed tracks they ever recorded, the guitar, bass, drums and vocals all being given equal time to shine. There's even a brass section, turning the track into something halfway between rock and Bradford soul. With two hit singles under their belt, the band took Regular Urban Survivors on tour. They were at the height of their popularity, playing at Sound City in Leeds and enjoying a top five success with Perseverance. The album was a huge success, they finished off the year with a third single Bad Actress and a support slot on Def Leppard's European tour, headlined a UK tour of their own and released a fourth single Easy. They were at the height of their success, had produced the best album of their career and had, again, been named Best British Band at the Kerrang! Awards. They were becoming a force to be recognised on the UK music scene. Unfortunately, it wasn't going to last. The humour always present in their music took a slightly darker twist with the single and this, combined with the new slide guitar style Yates had perfected made it sound quite unlike anything the band had produced before. The track reached #23, was well received and paved the way for what was to follow. The fourth album Shaving Peaches was well received but it was a remix of one track, Tequila that would gain the band large-scale crossover success. Produced by dance duo Mint Royale, the remix was, and still is, a stunningly good piece of pop rock. Adding what sounds a lot like a children's choir to Wright's voice works wonders, the rock elements still there but placed under a dance music backing. Radio One DJ, Zoe Ball, got hold of the track and played it so much that EMI insisted the band release it. The band, bound by contract, agreed and the Mint Royale remix was released later that year, going straight in at #2. 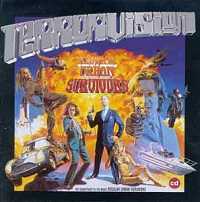 It was an unusual situation to find Terrorvision in, mainstream success having been handed to them on a plate with all the expectations that come with it. However, it exactly what the network wanted. Shaving Peaches was re-released with the Mint Royale remix and III Wishes was released as a follow up single later in the year. Although this was one of the strongest tracks from Peaches, it only managed to get to #42. The reasons for the relative failure of the track remain unclear, but one possibility is that the rock fans felt alienated by the success of Tequila and the 'teeny bopper' fans had little interest in a track that wasn't as easy to dance to. Regardless, the failure of III Wishes became the first misstep in several years of chart success for the band. Following a split from their record company in late 1999, the band spent most of 2000 writing and doing the occasional date. They resurfaced in 2001 with a new record company and their fifth album Good To Go. The urgency missing from Shaving Peaches had returned in spades, and had brought a keyboard player with it. D'you Wanna Go Faster? wouldn't sound out of place on Formaldehyde, a driving, urgent piece of rock that kicks off the album in style. There are some great tracks here, combining the anthemic tendencies of their later work with the flat out rock of Forrmaldehyde. Days Like These is the sort of chunky, swaggering rock anthem that the band excelled at whilst Fists Of Fury, what would be their final single, is a light hearted take on the search for a better way of life and the struggle against those trying to hold the band down. Which is ironic as the single was delayed at least once and it's final fate remains unclear. Ironically, the band themselves stated that Radio One were the reason for this. A decision was made to not play any Terrorvision tracks and this, apparently, resulted in Papillon deleting the single. 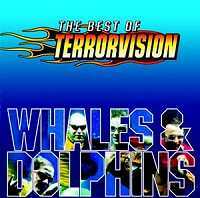 Regardless, on 24 September 2001, came Whales And Dolphins: The Best Of Terrorvision, and the band announced their final set of dates. The split was extremely friendly, so friendly in fact that they'll be playing a week's worth of reunion dates in April 2005, but the time had come. In their own words, the best band to come from Bradford beginning with 'T' were no more. Terrorvision were never going to reshape the face of modern rock or pop, they were never going to get huge amounts of critical respect. They never needed to. The most cheerful band to ever pick up a guitar, they produced insanely catchy, honest songs that were only ever designed to do two things; make you grin like a fool and sing the chorus at the top of your lungs. They succeeded beautifully. Oh! What I'd give/ what I'd take for/ Perseverance!